<strong>If I want the same UI Layout across all platforms, do I need to create a view?</strong> No. You can just use the master view straight. <strong>If I want to add iOS specific behavior, do I need to create a view for each iOS device?</strong> No. Just one per platform will cover that platform. <strong>What is the best way to make a common UI change across all created views?</strong> Update changes in the master view. <strong>I want to add some common UI controls to just my tablet views. What is the best way to do that?</strong> Create controls in the master view and hide them in the views where they are not needed. <strong>I made a change on my Android 3.5” view that I don’t see reflected on my other views?</strong> You would need to make the change to the other views as well. Use anchors and alignment on the master view where possible. No. You can just use the master view straight. No. Just one per platform will cover that platform. Update changes in the master view. Create controls in the master view and hide them in the views where they are not needed. You would need to make the change to the other views as well. Use anchors and alignment on the master view where possible. 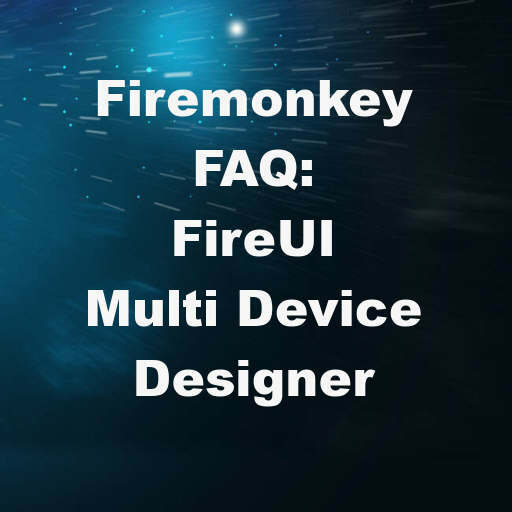 Head over to the full blog post for longer in depth answers to these FireUI questions for Delphi XE7 Firemonkey.